Samurai Sword | Ich bin ein Sender. Ich strahle aus! | I am a sender. I transmit! This simple pairing of a slender length of steel, wrapped snugly in a sheet of grey felt, is rich in associative contrasts. 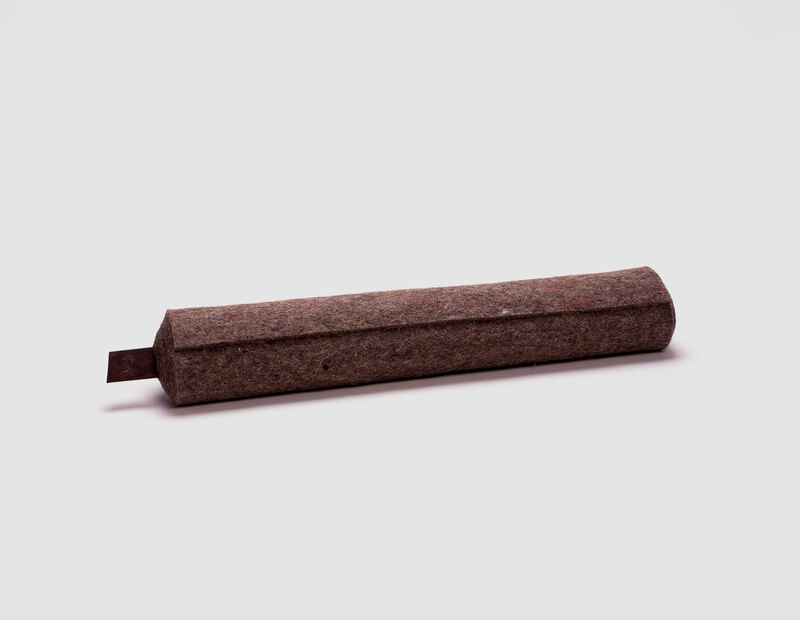 While the steel is rigid, cold and sharp, the felt is pliant, warm and yielding, qualities Beuys invested with a range of opposing connotations. Like other soft materials, felt was aligned in his thinking with femininity, while the harder substance steel evoked traits that he regarded as masculine.1 It is fitting, therefore, that his coupling of the two materials should here evoke a coupling of the sexes. 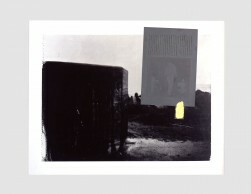 The work’s title, however, brings a second and less obvious set of contrasts into view. Since the mid-1960s, Beuys had used the samurai sword as a symbol of East Asia. In his works of this period, the sword had often surfaced in the guise of a blood sausage, a hybrid object that combined the sword’s Asian associations with those of a European food item. 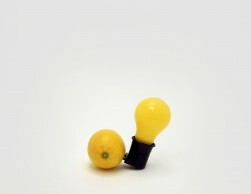 This fusion embodied Beuys’s concept of Eurasia, an imagined integration of European and Asian societies, which would combine their respective attributes: the rationalism and materialism of Europe, and the intuitive, more spiritual modes of experience that Beuys saw as prevalent within Asia. Through its use of European materials to construct an East Asian object, the Samurai Sword multiple brings these same connotations into play. In contrast to Beuys’s prior work, however, the sword appears here in a more straightforward guise. No longer imagined as a blood sausage, it has become a short metal blade sheathed in felt. By uniting these two sets of contrasts, this deceptively simple-looking object becomes an elegant expression of a fundamental theme of Beuys’s art: his efforts to bring harmony and balance to forces, entities and qualities that are frequently opposed to one another.